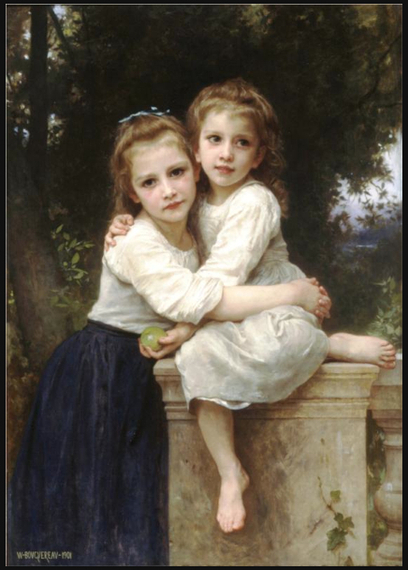 William-Adolphe Bouguereau, Two Sisters (restored), 1901, oil on canvas, 44 x 30 inches, Collection of Lawrence University. Though I attended the Academy of Fine Arts in Vienna for nearly six years, I didn't want their degree. When I was enrolled, back in the early 80s, you graduated with a piece of paper that conferred upon you the title of 'Akademische Maler' or Academic Painter. In working towards my earlier 1977 Bachelor's degree in the States, every art history course, and most of the studio painting courses, agreed that Academic painting was the worst crime against art ever committed. 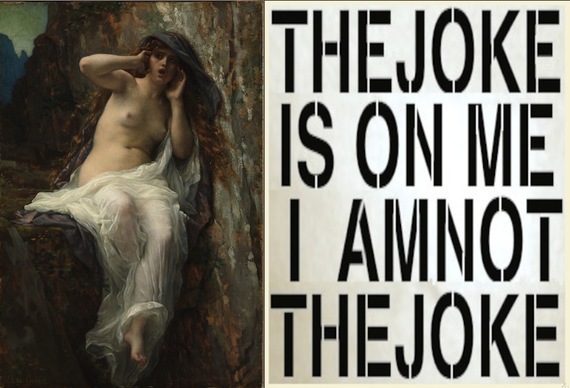 In my sophomore year at a small Midwestern liberal arts university this manifested itself in vandalism against the 19th century academic paintings that had the bad luck to hang in the same auditorium where art history lectures were delivered. 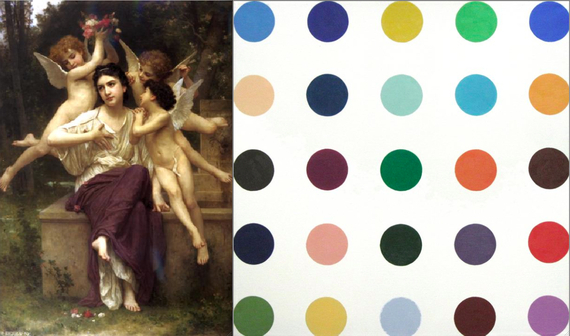 A large Bouguereau painting received a dozen puncture wounds from the pens and pencils of the righteous. By the time I got to Vienna the last thing I wanted to be was an Academic Painter. At the time the term Academic Art referred to those classically trained artists of the 19th century who had learned their craft in academies, came up through the rigors of proscribed teaching methods, and created content to fit the tastes of the ever-widening bourgeoisie. In my art history classes it was the French version that came in for the strongest criticism, with painters like William-Adolphe Bouguereau held up as the decadent boogieman that Impressionism, and then Modernism, rebelled against. When Pablo Picasso painted his great "Les Demoiselles d'Avignon" the purge of the former century's academic decadence was complete. That was 1907. The decadence of today's art world makes the excesses of the 19th century seem quaint by comparison. Even art critics who helped to build the current edifice are appalled by dealers, billionaires and auction houses who manipulate the system, and by the the shallow, slick work that is passed off as the best that contemporary culture has to offer. Museums, galleries and art critics have all been complicit in creating a contemporary art scene that expects minimal creative effort from its artists and delivers little of value to society at large. With none of the rigor of 19th century training, university art departments and art schools roll out thousands of wannabe artists annually in what must be one of the greatest educational scams ever perpetrated. At least the 19th century Beaux Arts painters were trained to make a living of it. The school system that births the Academic Art of today is the end product of the age old desire of artists to be more than artisans. Da Vinci, Poussin, Watteau, et al, shared a desire to elevate the mind above the hand, and to move up the social ladder as intellect equated with nobility, manual labor with the masses. The apotheosis of this tendency has come in the last decades as academia has removed skill of any kind as a quality necessary in the creation of art. As art has moved from being an organic function of society and into the hallowed halls of academia, it has shifted from being something that artists did to bring meaning to their communities, into self-reflective gestures aimed at a highly-specialized intellectual elite. In the process art has lost its relevance to the society from which it springs. The push in university departments to make art into a profession similar to those you'll find in the sciences, medicine or law has resulted in a tremendous glut of academic artists with scant venues to show their work, and an almost complete lack of career opportunities. Since the 1950s MFA programs have proliferated like mold on a rotting orange. Those with MFAs confer more MFAs, operating from secure professorships that enable the production of a purely academic art of interest only to other academics. They train their students to make the same kind of art, but in this over-saturated employment arena they aren't going to find the same cushy tenure positions occupied by their mentors, positions that allow for an academic style free of the need for sales. A small handful of well-connected schools, with powerful faculty, can choose a tiny number of their favorite students and propel them into the art market, but what about the other 250 MFA programs across the country? What happens to the thousands of newly minted MFA grads they churn out each year? The educational system that spawns this surfeit is an entrenched and potent force. Who decides which academic artists are worthy of attention? Others with similar academic degrees. The gates to academic and artworld success are controlled by those educated through the same process, indoctrinated by the same ideologies, instilled with the same ideas about what art is or isn't. Academic Art, as practiced in western culture, has now colonized the entire world. Cultures that once had vibrant, homegrown arts communities connected to their ethnic populations, now produce the art of the academies. From New York to Paris, from Istanbul to Dubai, from Tehran to Mumbai, from Moscow to Shanghai, all the art looks like it came out of the same MFA program. It is all academic.